This is a scarse 1701 map of North America and South America by Herman Moll. Centered on the American continent, this map covers from the Arctic Circle to Tierra del Fuego. The map features much of note including a presentation of California as an Island, the early speculative mappings of New Zealand an the inclusion of Lake Parima and Xarayes in South America. Baja California was subsequently discovered in 1533 by Fortun Ximenez, who had been sent to the area by Hernan Cortez. When Cortez himself traveled to Baja, he must have had Montalvo's novel in mind, for he immediately claimed the 'Island of California' for the Spanish King. By the late 16th and early 17th century ample evidence had been amassed, through explorations of the region by Francisco de Ulloa, Hernando de Alarcon and others, that California was in fact a peninsula. However, by this time other factors were in play. Francis Drake had sailed north and claimed 'New Albion' near modern day Washington or Vancouver for England. The Spanish thus needed to promote Cortez's claim on the 'Island of California' to preempt English claims on the western coast of North America. The significant influence of the Spanish crown on European cartographers caused a major resurgence of the Insular California theory. Eventually, Eusebio Kino, a Jesuit missionary, traveled overland from Mexico to California, proving conclusively the peninsularity of California. In the extreme northwest, just above insular California, we come across a mysterious land labeled 'Land of Iesso.' Though Yesso or Jesso is a name traditionally associated with Hokkaido, this land mass is more commonly called Gama or Gamaland. Gama was supposedly discovered in the 17th century by a mysterious figure known as Jean de Gama. Various subsequent navigators claim to have seen this land and it appeared on numerous maps well into the late 18th century. At times it was associated with Hokkaido, in Japan, and at other times with the mainland of North America. Moll curiously maps it as a large insular landmass dividing America and Asia, which strongly advocates for his belief that access to the wealth of Japan and China was but a step away from the western shores of North America. East of the Land of Iesso, the map notes the Strait of Anian. Anian was first mentioned in the journals of Marco Polo and was first noted on maps by Bolognini Zaltieri in 1561. Later the term was popularized in a John Donne poem, 'Anyan if I go west by the North-West passage.' In the 18th century, it was interpreted as the Bering Strait by cartographers, successfully transitioning it from the realms of fiction to cartography. Anian presupposed the existence of a Northwest Passage and, as such, was entirely mythical, though the lands that are now Alaska long bore that name. Further south the cartography of South America is nearly as confused as that of North America. Though by this point in history, the general outlines of South America are well established by regular circumnavigations of the continent, the interior is entirely speculative. Many Europeans believed that the most likely site of El Dorado was the mythical city of Manoa located here on the shores of the Lake Parima, near modern day Guyana, Venezuela, or northern Brazil. Manoa was first identified by Sr. Walter Raleigh in 1595. Raleigh does not visit the city of Manoa (which he believes is El Dorado) himself due to the onset of the rainy season, however he describes the city, based on indigenous accounts, as resting on a salt lake over 200 leagues wide. This lake does have some basis in fact. Parts of the Amazon were at the time dominated by a large and powerful indigenous trading nation known as the Manoa. The Manoa traded the length and breadth of the Amazon. The onset of the rainy season inundated the great savannahs of the Rupununi, Takutu, and Rio Branco or Parima Rivers. This inundation briefly connected the Amazon and Orinoco river systems, opening an annual and well used trade route for the Manoans. The Manoans who traded with the Incans in the western Amazon, had access to gold mines on the western slopes of the Andes, and so, when Raleigh saw gold rich Indian traders arriving in Guyana, he made the natural assumption for a rapacious European in search of El Dorado. When he asked the Orinocans where the traders were from, they could only answer, 'Manoa.' Thus did Lake Parime or Parima and the city of Manoa begin to appear on maps in the early 17th century. The city of Manoa and Lake Parima would continue to be mapped in this area until about 1800. Further south, Moll notes Lake Xarajes, associated with another gold rich indigenous groups Xarayes. The Xarayes, a corruption of 'Xaraies' meaning 'Masters of the River,' were an indigenous people occupying what are today parts of Brazil's Matte Grosso and the Pantanal. When Spanish and Portuguese explorers first navigated up the Paraguay River, as always in search of El Dorado, they encountered the vast Pantanal flood plain at the height of its annual inundation. Understandably misinterpreting the flood plain as a gigantic inland sea, they named it after the local inhabitants, the Xaraies. The Laguna de los Xarayes almost immediately began to appear on early maps of the region and, at the same time, almost immediately took on a legendary aspect. The Strait of Magellan is also mapped asn the 'Strait of Magalanick.' Discovered in 1520 by the Portuguese sailor Ferdinand Magellan, the first explores circumnavigate the globe, this natural channel linking the Atlantic and Pacific Oceans though a challenging route to navigate (given the unpredictable winds and currents), is the fastest connection between the two oceans. Overall, an important map noting the cartographic speculations of the time. 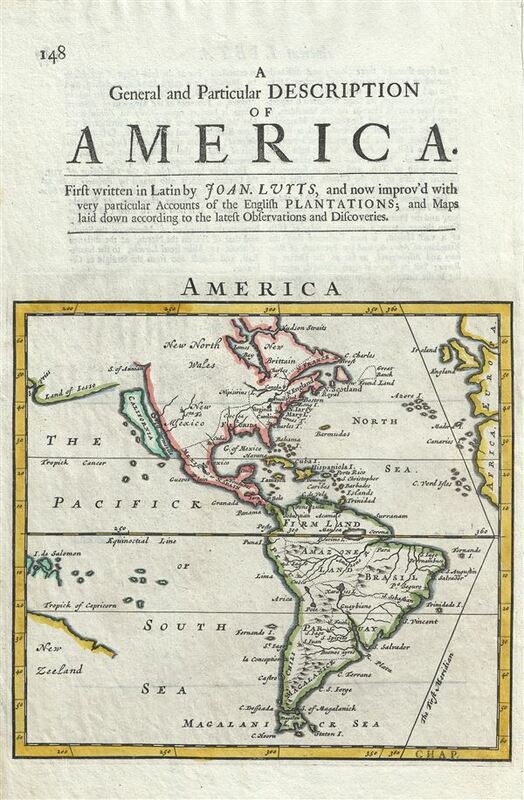 This map was issued in Herman Moll's 1701 System of Geography.